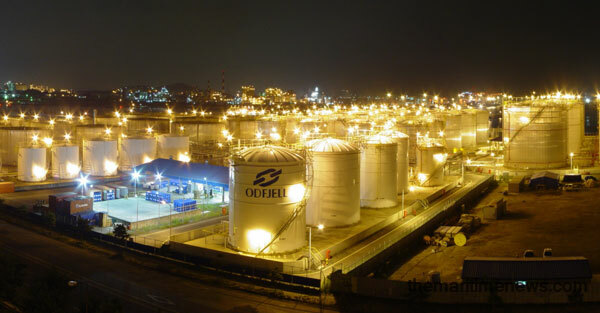 Odfjell Terminals Europe and Grand Port Maritime du Havre (GPMH) have today signed a Site Reservation Protocol for a plot of land in the Port of Le Havre to develop a bulk liquid terminal. The planned terminal will be located inside the Port of Le Havre along the Grand Canal Maritime and the plot is approximately 31.5 hectares. Hervé Martel, Chairman of GPMH Management Board, states: “signing today the Site Reservation Protocol with Odfjell Terminals Europe is a significant stage for the GPMH, not only because it closes the phase of call for projects launched in 2011 in order to boost bulk liquid storage activity in its port and industrial zone, but also because the interest of this major player in bulk liquid transport and storage meets that of the GPMH, of the industries of the river Seine artery and beyond; it will thus contribute to strengthen their attractiveness and competitiveness”. The first phase will consist of at least 150,000 cbm for storage of petrochemical and petroleum-related products. Construction is currently expected to start in 2015 and the terminal is foreseen to open in 2nd half 2017. The total investment for the first phase is estimated to be about EUR 150 – 200 million. HAROPA – Port of Le Havre is one of Europe’s largest ports, strategically located by the entrance to River Seine. The port is a deepwater port able to accommodate all types of sea-going vessels. Le Havre is an important industrial port with a local chemical cluster, which is a part of the Seine Valley industrial complex till Paris and its region. The industrial and port zone of Le Havre and Rouen is indeed the second biggest in Europe in terms of industrial setting-up in chemistry and petro-chemistry. Traffic of Port of Le Havre was 64 million tons in 2012 (36.7 for liquid bulk). According to Jan A. Hammer, President/CEO in Odfjell SE: “this site reservation is another important step for expanding and growing our terminal business in Europe. When the terminal is built, we can offer our customers storage capacities in the most important shipping hubs for petrochemicals and other speciality bulk liquids in Europe with presence in Rotterdam, Antwerp and Le Havre. This will strengthen our position of being a preferred and leading liquid chemical storage provider. In the coming months, customer requirements will be fine-tuned and basic engineering will be started before permit applications will be submitted and Odfjell and GPMH make a final decision to proceed”. Posted by maritimenews on July 15, 2013. Filed under All news, Business, Dredging News, Latest news, World. You can follow any responses to this entry through the RSS 2.0. Both comments and pings are currently closed.